Life began with burning ice and biting flame. To the south is a realm called Muspell. It seethes and it shines with dancing flames. Only those born into it can endure it. To the north is a realm called Niflheim. It is covered with ice and sweeps of snow. In the center lies the spring Hvergelmir and that is the source of the eleven rivers named Elivagar: Svol, Gunnthra, Fjorm, Fimbulthul, Slid, Hrid, Sylg, Ylg, Vid, Leipt, and Gjoll. Between these realms lied a realm of vast emptiness known as Ginnungagap. The eleven rivers streamed into this emptiness and turned to ice. Eventually the northern part of Ginnungagap became a realm of ice and frost, haunted by gusts of wind. As this happened, the southern part became molten and glowing, but the middle was as mild as hanging air on a summer evening. Here in the middle the heat from Muspell met the cold of Niflheim and the ice began to melt and drip. Life began in these drops and formed the giant Ymir. Ymir was a frost giant and evil from the first. He sweat while he slept and a man and woman grew out of the ooze under his left armpit. One of his legs also fathered a son on the other leg. Ymir is the forefather of all the frost giants. As the ice in Ginnungagap continued to melt, the fluid formed a cow. She was called Audumla and Ymir fed off the four rivers of milk that flowed from her teats. Audumla fed off the ice itself. She licked the salty blocks of ice, and by the evening of the first day a man’s hair had come out of the ice. By the evening of the second day a man’s head had come out. On the evening of the third day the whole man had come out. His name was Buri. Buri was attractive, strong, and tall. He had a son named Bor who married a frost giant named Bestla. They had three sons named Odin, Villi and Ve. These three sons of Bor grew to hate Ymir and the brutal frost giants. Finally they attacked and killed Ymir. So much blood streamed from his wounds that the flood drowned all the frost giants except Bergelmir and his wife. The sons of Bor sailed on the gore in a boat made of a hollowed out tree trunk. Odin and Vili and Ve carried the body of Ymir on their shoulders and brought it to the middle of Ginnungagap. This is where they made the world from his body. They made the earth using his flesh and the mountains from his broken bones; from his teeth and jaws and fragments of his shattered bones they made rocks and boulders and stones. His blood was used to make lakes and the sea. The ocean was laid in a ring around the earth, so wide that most men would not even consider trying to cross it. Then the three brothers raised Ymir’s skull and made the sky from it, placing it so that it’s four corners reached the ends of the earth. A dwarf was set under each corner, and their names were East and West and North and South. Then they seized the sparks and glowing embers from Muspell and called them sun and moon and stars; they put them high in Ginnungagap to light heaven above and earth below. The earth was round and lay within the ring of the deep sea. The sons of Bor marked out tracts of land in Jotunheim and gave them to the frost giants and rock giants. Further inland was Midgard and they surrounded it with an enclosure that was shaped out of Ymir’s eyebrows. They also flung Ymir’s brains into the air and turned them into clouds. One day, Odin and Villi and Ve were walking along the land where the earth meets the sea and came across two fallen trees; one an ash, and the other an elm. They raised these trees and made from them the first man and woman. Odin gave them the spirit of life; Vili gave them sharp wits and feeling hearts; and Ve gave them the gifts of hearing and sight. The man was called Ask and the woman Embla They were given Midgard to live in. All families and nations and races of men are descended from them. A List of Norse Beings:Good site for Norse Myths. Asatru Folk Assembly: the Norse religion still lives. 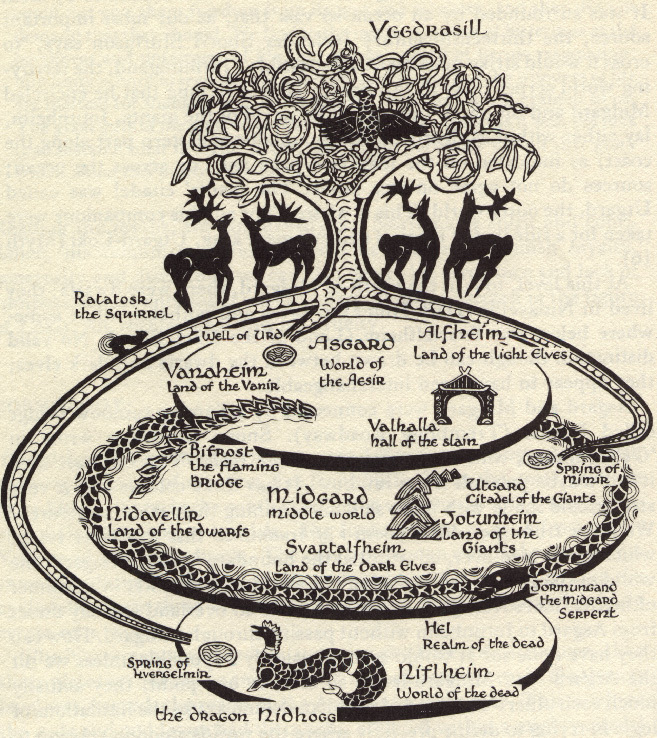 Encyclopedia Mythica: Norse Mythology: Very good site. Sometimes down though. Try again if it's not working today. The Odinic Rite: another Asatru site. Lots of great information on the gods. Odin's Home Page: has some interesting information about Odin. Svava's tribute to the gods: Good page about the Norse gods.